Hamas leader and Palestinian PM Ismail Haniya has called on the international community to end its economic boycott of the Palestinian Authority (PA). It comes after Hamas and its rival faction, Fatah, agreed to form a new government of national unity. 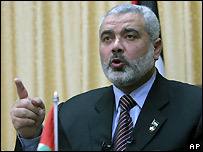 Mr Haniya said the US and the EU should respect the agreement as the will of the Palestinian people. 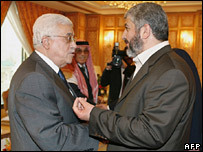 The Hamas-led PA has been shunned for denying Israel's right to exist and failing to meet other conditions. "I say to the Quartet [of international mediators] and to the European Union that this is the will of the Palestinian people," Mr Haniya said in an hour-long televised address. "They should respect it and they should work to end the status of siege". The EU, US and Russia have maintained a crippling economic boycott of the Palestinian government since Hamas won legislative elections in January 2006. The UN is the fourth party of the Quartet which has been trying to restart the Middle East peace process. EU foreign ministers meeting in Brussels on Monday said they will wait for the formation of a new Palestinian government before making a decision on resuming direct aid. Their statement said they will only engage with the new Palestinian government if it recognises Israel's right to exist, renounces violence and accepts previous agreements between the PA and Israel. For months, Hamas and Fatah - the latter once dominant in Palestinian politics - have struggled to form a government of national unity that could get the boycott lifted. Gunmen loyal to the factions have fought bloody battles in the Gaza Strip in recent months, leaving more than 90 Palestinians dead between late December and early February. Mr Haniya said in his speech that his government would resign in the coming days, clearing the way for President Mahmoud Abbas of Fatah to call on him to form a new government. Hamas and Fatah agreed in Mecca to a division of cabinet positions, but the key post of interior minister - who controls the security forces - was left undecided. Hamas agreed to respect past Palestinian agreements that recognise Israel. But the BBC's Alan Johnston in Gaza says this still falls short of the explicit declaration of recognition that the West has demanded.